Are you exhausted from constant thoughts about food and your body? Do you wish you had more direction or guidance in your recovery? 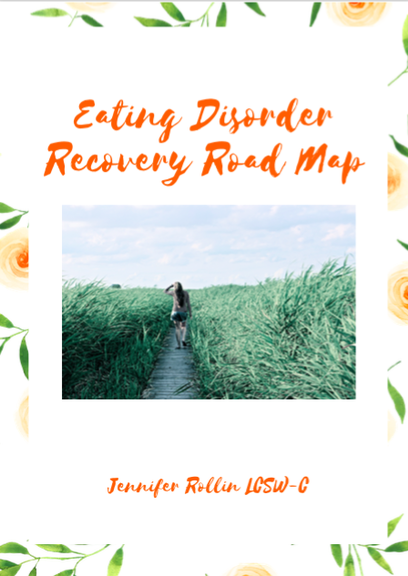 I created "The Eating Disorder Recovery Road Map" to help you to put in a plan in place for your recovery, set goals, gain insight, and complete assignments that I give to my clients. I'm an eating disorder & body image therapist and founder of The Eating Disorder Center in Rockville, Maryland. I'm thankful to have helped many people to recover from eating disorders. I write and speak about eating disorders and body image issues on Fox News, The Huffington Post, Psychology Today, National Eating Disorder Conferences, and Therapy Centers. For $105 you will receive a digital copy of the 15 page workbook called "The Eating Disorder Recovery Road Map," a 30 minute audio guided recording where I walk you through each exercise, two handouts, 10 inspiration cards, and an additional list of my favorite resources.